The Friendship Doll by Kirby Larson. Delacorte Books for Young Readers, 2011. Currently available. Face Value: They might as well just slap a sticker on this cover that says, “Boy Readers: Look Elsewhere.” It is alarmingly pink and flowery, and I’m not a fan of the repeated motif of girls in old-fashioned dresses. It’s vaguely psychedelic. 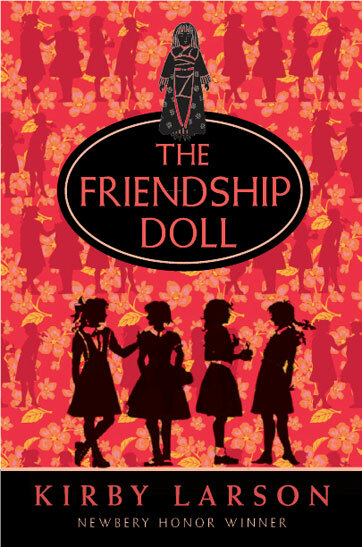 Also, I kept staring at this cover searching for the “friendship doll” mentioned in the title. She’s there, right up above the title, but she kind of gets lost amongst all of the other stuff that is going on in this busy mess of a cover. Does it break the slate? Yes! The Slatebreaking factor of this book was a pleasant surprise. The cover, and the fact that this was a story about four girls connecting with a doll, had me doubting its Slatebreaking potential. What I like about it is that it features not just one, but four (four!) spirited young ladies. Each one of them has a distinct personality, and their vastly different families and lifestyles showcased how girls can shine no matter what their socio-economic circumstances. Willie Mae and Lucy stood out especially for me, because they utilized literacy – their exceptional reading and writing abilities – to break the slate. Who would we give it to? I think that this book has a very limited age range of young readers that would find it appealing. The characters in the book are all a little too old for dolls, but despite their age they find themselves won over by this unique friendship doll from Japan. Consequently, you would have to find readers sophisticated enough to enjoy this novel but still young enough to be into dolls. Give this book to a girl who is still obsessed with her American Girl doll. She will connect with the girls in this story. Review: The Friendship Doll tells the story of a Japanese ambassador doll that travelled to the United States in the 1930s. As a gesture of friendship between the two nations, Japan sent handcrafted dolls to the United States, and these dolls traveled to a variety of destinations, delighting children and representing cultural exchange. Kirby Larson’s book tracks the journey of one doll ambassador, Miss Kanagawa. Miss Kanagawa’s arrival in the United States is greeted by a committee of wealthy New York girls, including Teddy Roosevelt’s granddaughter and our first girl of interest: Bunny. Bunny is kind of a brat. She spends most of her chapter pouting about how the Roosevelt girl was chosen to give the speech at the doll presentation ceremony, rather than her. I connected with Bunny in that I, too, was a bit of a show off when I was a kid, and I spent a good amount of time pouting about things. But then Bunny meets Miss Kanagawa and she has a change of tune. Miss Kanagawa has this power over girls – she changes their attitudes. She helps them to see ways in which they could be more fair and just. How does she do this? SHE INFILTRATES THEIR MINDS. Yes, you read that correctly. Miss Kanagawa uses some sort of telepathic heart-to-heart communication to get girls to re-calibrate their bad decisions and be nice. These connecting passages are written from Miss Kanagawa’s point of view, as little interjections throughout each girl’s narrative. Her strict, formal voice contrasts abruptly with the third-person-point-of-view of the historical narrative. This was supposed to be a heartwarming part of the story in which a stodgy, uptight doll grows a heart and helps out little girls. Instead, it was terrifying. You what I was not afraid of before reading this book that I am now very afraid of? Sentient dolls. Although I appreciated what Larson was trying to do by telling the story from multiple perspectives, I really hated the doll interjections. I wish that they had been excised from the book, leaving the perfectly fine historical narrative of the four girls to stand on its own. Miss Kanagawa goes on to meet three more girls: Lois, a spirited future aviator who visits the World’s fair; Willie Mae, a gifted reader who gets a chance to bring joy to an elderly woman’s lonely life; and Lucille, a drifter child who uses her letter-writing skills to boost her family up after tragedy. Each one of these girls is written with distinctly different narrative. Larson sets up these widely varying social circumstances so that the reader gains an understanding of the vast differences in lifestyle that occurred around the United States during the 1930s. I so appreciated how these young girls made the best of their circumstances and used their talents and skills to improve their own lives and the lives of others. There is nothing that tugs at my heartstrings quite like an old-fashioned, hard-working girl with go get em’ spirit. It’s too bad that crazy, mind-invading doll intruded! If you can get past the creepy doll passages, there is a lot to enjoy in this book. This entry was posted in Middle Grade, Reviews and tagged Dolls, Historical Fiction, Kirby Larson. Bookmark the permalink. Yes, I read and reviewed The Friendship Doll because of the Newbery buzz – and I am glad that I did! I cannot wait until the Medal and Honors are announced! Will you be watching the live webcast of the announcements? Thanks for your comments about our review format, too – it is something we designed when we started and may fine tune in the future, so it is good to know what people find useful. As a fellow Green Gables fan, I am delighted to find your blog. Love your passion for finding strong girl characters. I appreciated your spirited and honest review of The Friendship Dolls and look forward to reading more of your thinking! Thank you for stopping by! We love bright, strong girl characters – thank you for bringing these fascinating girls to life.